Yup, one skein of Anne for these looong socks and 10" long women's feet. I had about 20 gm of the yarn left over as well! Shocked, but I will definitely be buying Anne again... there's no way I can see running out of yarn with a normal cuff length pair of socks. I also blocked the socks by washing them in a bit of kookaburra and warm water (all pics are unblocked though... took pics right after they were done last nite)-- and had lots and lots of bleed. Not a shock since the reds are so deep, and since red has more of an inclination to bleed than other colors... I washed once and rinsed 4 times, all had red in the water. Not a big deal, I'll handwash these alone anyway, but just you know-- a note :) When I pressed them dry on a towel, there was no bleed on the towel though! As far as the yarn fitting the pattern, I was able to hit the row gauge (8 sts/inch), but my column gauge was off-- the pattern calls for 11 sts/column inch, where I had 12 sts/column inch with the Schaefer Anne on US 0's (2mm). So where the leg was supposed to be 12" from cast on edge to top of the heel, I had 10.5" unblocked/unstretched. I didn't know if I would have enough yarn to extend the leg so its knit exactly as written-- mine is a bit shorter than the pattern calls for. Not sure I'd extend it though-- 20 gm may cut it close. Round toe, very cool. No grafting. Very short though... good if you like that sorta thing, and you could make it longer. Dutch heel. Looks quite cool with the purl compliment right next to the turn, I think. The heel as written is much less sturdy than "regular" heels I'm used to-- its simply stockinette with a few columns of purl sts that flow from the above lace pattern. 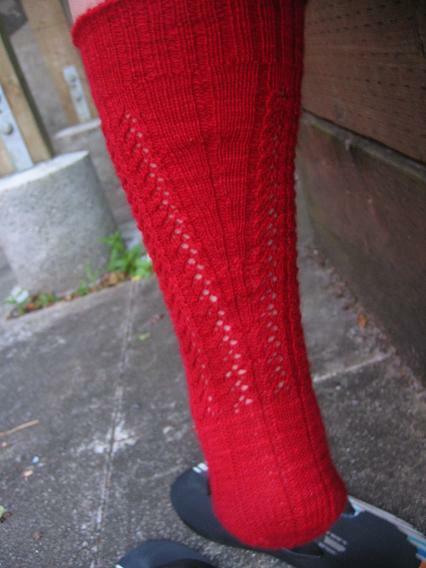 I think its perfect for this sock though, its a dainty sock and you don't want a double thick heel with slipped sts. If I wore anything but tevas and converse, these socks would feel great in a pair of low slung shoes, no bunching at the heel/back of the shoe, very nicely fitted especially in the superfine yarn. I did pick up stitches at the heel by picking up the outside of the slipped st with a spare needle and knitting tbl, so the seam isn't on the inside... with the fine yarn, it makes for an even finer and well fit sock (no seams on the inside, very smooth feeling). Back panel "seam" with decreases down the leg. Gorgeous! And thanks for the full review on Schaeffer Anne - it looks like wonderful yarn. The word id for this comment is "iluvoh". That's how I feel about your socks. I love, oh! Seriously, they look great. You've convinced me about Anne, but the knot thing is stinky. You're an inspiration! You should re-name your blog "Sock Pro!" Beautiful job! I love that you show all different angles so we can actually "see" the whole sock. 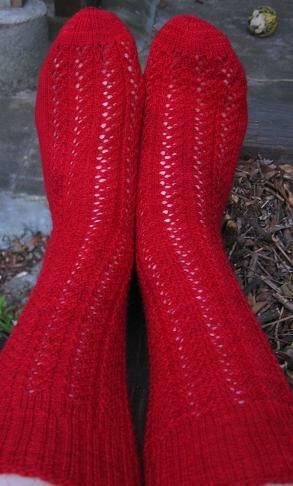 Those are some seriously red, seriously gorgeous socks. It's nice to know the Anne knits up as nice as it looks. Oh, those socks are so pretty! The yarn looks really nice. I haven't tried Anne before. I love it when solids have variations in it like the Anne does. Very nice knitting! So cool! And dang you knit fast. I have some Anne that I am itchin' to try. Thanks for the inspiration! beautiful! 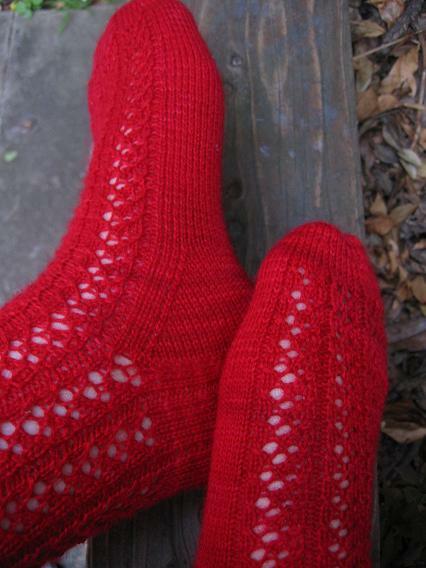 I hope that I'll be able to make fancy schamncy socks like this someday too. :) they look superb! I came across a knot in the yarn for the child's sweater I am knitting. Luckily it was at the end of a row - I hate it when I am in the middle of the row and come across a knot! Those socks are awesome. I love them. I've been eyeing the pattern for awhile, seeing your is just the motivation I need to make some for me. Do you have a general idea of the yardage you used? I have two skeins of Lornas set aside, probably not enough, huh? Anyway, great job on such beautiful socks! Gorgeous socks. And thank you for all the notes and pictures. It was a very enjoyable post. The socks are beautiful. Thank you for all the different views. 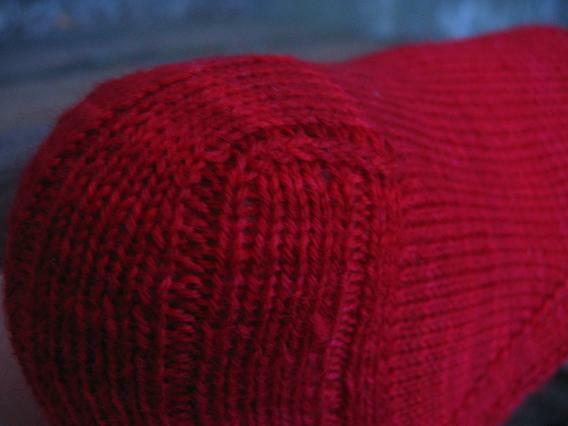 The heel looks both pretty and unusual with the purl stitches running through it. 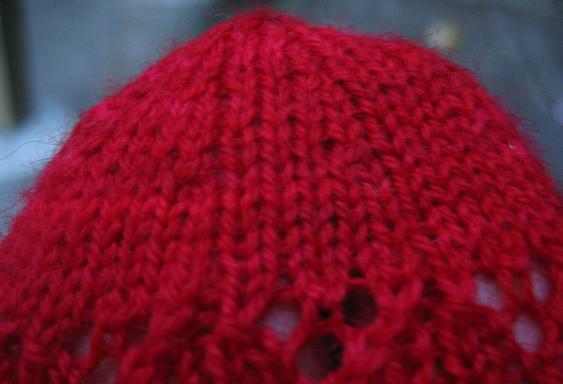 I love that vibrant red, and I also love the back st. panel and "seam". Those are so gorgeous! I have Anne AF thanks to your suggestion too, so now I have to use it! Have you dried "Color Catcher" cloths? They're in the laundry detergent aisle in the grocery store. I love them -- the color really does end up on the cloth and not the rest of your laundry. they look great! I didn't think I'd like the way the back would look but I do - a lot! The lace pattern kind of looks like Hedera. Those are really quite amazing! They are gorgeous, they look so elegant. I'd keep them on my feet and just admire them all day. The colour is perfect for them. These are incredible! I love the detailed shots. Fantastic shaping.you got them done in no time at all. Now, how did you get that back of the leg shot??? Those came out absolutely gorgeous. I have been eyeing some Anne yarn myself and I can't decide on a color. Oh my, those are SO gorgeous. must. learn. to. knit. socks. Beautiful socks and wonderful pics! Your work is really outstanding and I really enjoy the blog. Those stockings are soooo beautiful! Your socks are absolutely friggin' gorgeous! I've never attempted anything that long or requiring calf shaping and it sounds quite daunting. I'm really impressed that your block your socks too! Mine get put in a basket as is. I agree with the knot factor being annoying. I refuse to buy Noro because not only is it uneven and full of debris, but there are usually multiple knots per skein. They can keep their overpriced crap, give me some plain old cheap knitpicks any time. Fabulous socks! I've been eyeing that pattern for some time; now I'll have to make it. I *love* the color of that Anne. The few times I've worked with it, the colors were more variegated. I think the Dutch heel is my favorite from her books, it looks *great*. Verrry pretty socks! Maybe I'll add that to my ever lengthening to-do list!! 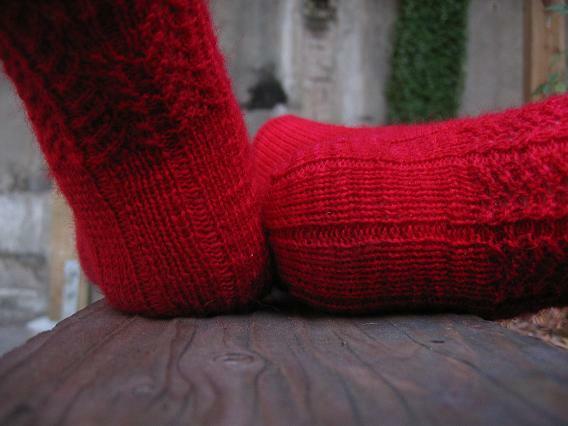 Lovely red socks! Is that a sock knitting world record? You are fast! Wish you lived near me and could give me lessons!